For aggressive, advanced gum diseased areas that have not responded well to conventional treatments when the rest of the mouth has. A blue dye is washed into the area. A “soft” laser is then used to “burst” and otherwise disrupt and kill the harmful bacteria left behind by other more conventional professional techniques. Periowave is a non-invasive, broad spectrum non-antibiotic therapy that combines advanced non-thermal laser technology with wave-length matched photosensitisers to target pathogens that normal scaling and root planing can leave behind and can significantly improve treatment outcomes when added to conventional scaling and root planing. Using photoactivated disinfection it quickly destroys gram negative bacteria without promoting the development of bacterial resistance. There is no heat involved in this process and the tissues are completely undamaged. 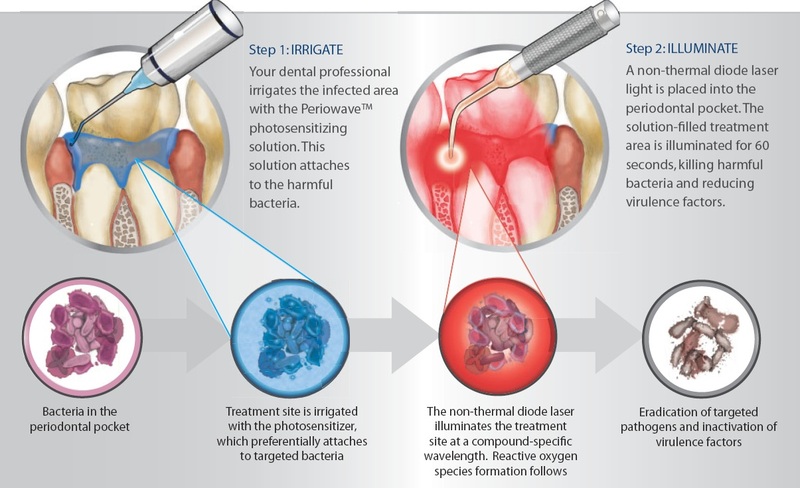 Periowave™ utilizes a non-thermal laser light combined with a photosensitizing solution designed to kill bacteria associated with gum disease. Killing the bacteria halts the progression of the disease and allows healing to begin. Periowave is designed to be used in conjunction with scaling and root planing to offer dentists and hygienists a powerful treatment for gum disease.